Kosovo's president has urged political parties to work faster to unite behind a strategy to smooth ties with Serbia, which he called the only way for Kosovo to join the European Union. Hashim Thaci on Thursday called on politicians to reach a consensus soon on the government's negotiating team, a move strongly opposed by the opposition so far. Brussels has made it clear the EU will not accept Kosovo and Serbia if they don't resolve their conflict. Thaci said tough talks were ahead as the countries are set to negotiate on a 430-kilometer (270-mile) long border demarcation. "There will be no bilateral recognition without concluding such a process," he said. Opposition parties have turned down Thaci's recent suggestion of a "border correction," or a land swap with Serbia to resolve the border dispute. Some Kosovo and Serbian officials have proposed a deal based on where ethnic Serb and Albanian minorities are concentrated — Kosovo's northern Mitrovica region for Serbia's Presevo Valley. 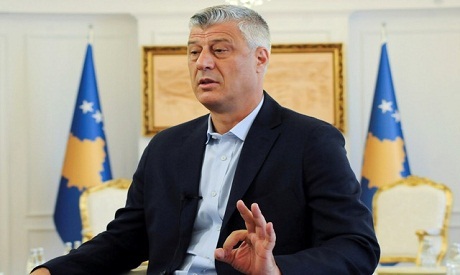 Thaci has opposed Kosovo's territorial division but has not clarified how Serbia would agree to give Presevo Valley without something in exchange. On Wednesday Kosovo's opposition political parties sent a letter to the EU foreign policy chief Federica Mogherini saying that Thaci "does not represent us, nor the people of Kosovo in this process." They said any territorial swap or change is "dangerous for peace in the region and therefore are unacceptable." Serbia doesn't recognize Kosovo's 2008 independence, declared nine years after NATO intervened in the 1998-99 war to stop an onslaught by then-Serbian president Slobodan Milosevic against Kosovo ethnic Albanian separatists. Both countries hope the seven-year long EU-facilitated dialogue to normalize ties will reach a final stage with a bilateral, legally binding agreement.